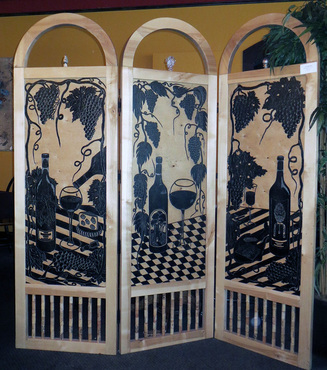 ﻿Inspired by my love for fine wine, champagne, and smoky martinis, I devoted four years to the creation of this three panel screen. Each panel is carved on both sides; six separate carvings taking at least six months each to complete. 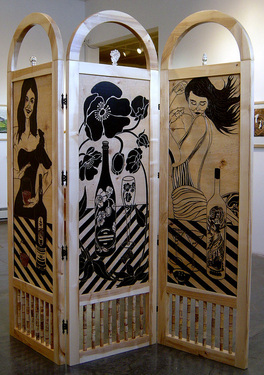 I pulled prints off of each panel before it was framed with birch and detailed with sterling silver and crystal wine stoppers in the arches and 80 wine corks on steel rods spindled at the base of each panel.